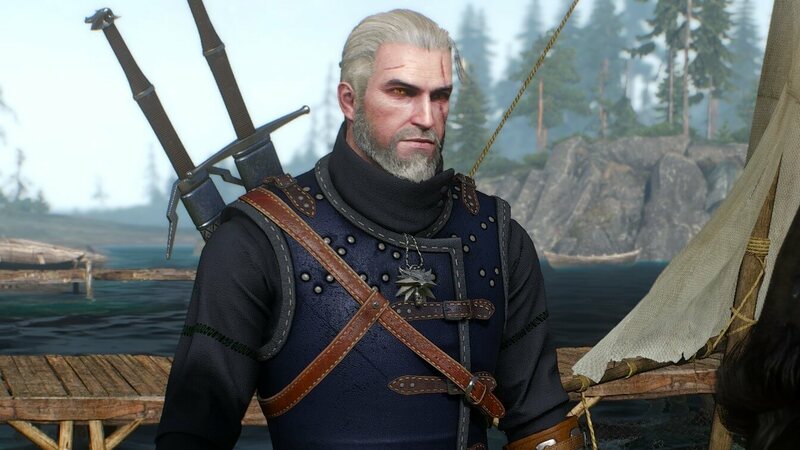 Witcher 3 has offered players many different play styles and builds. However, there are two concepts players need to understand to experience the game at it’s full potential. For those that say that the game is all about the story, I say rubbish. The developer hasn’t spent so much resources, making such an intricate combat, alchemy, crafting and enemy system for it to be just about the story. It’s designed much like Dark Souls, and Death March is the best way to fully immerse yourself. There is only one build type/style that is both challenging and engaging to play. 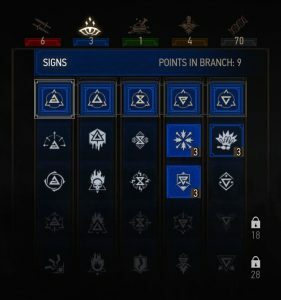 Sign builds aren’t appealing, because Geralt isn’t a wizard nor a mage, but a Witcher. There is a reason why he carries two swords. Shooting a stream of fire out of your hands stops you from using them. Therefore, the true Witcher builds are a hybrid, with a major focus on Combat, Alchemy and a minor focus on Signs. 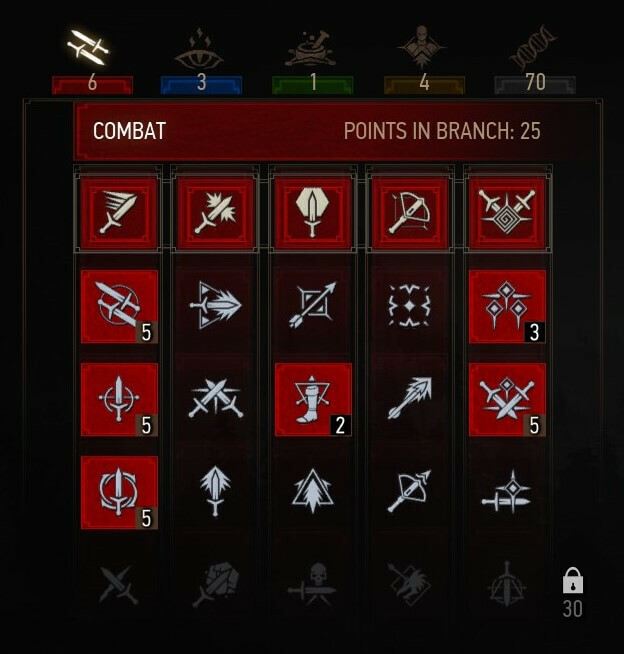 The general skills branch contains the best early game skills, due to their low investment requirements. The first point spent will increase HP by 500 and allow for one or two mistakes at Death March difficulty. You will then need to decide whether you want to take hits and hit hard or avoid hits and hit fast. 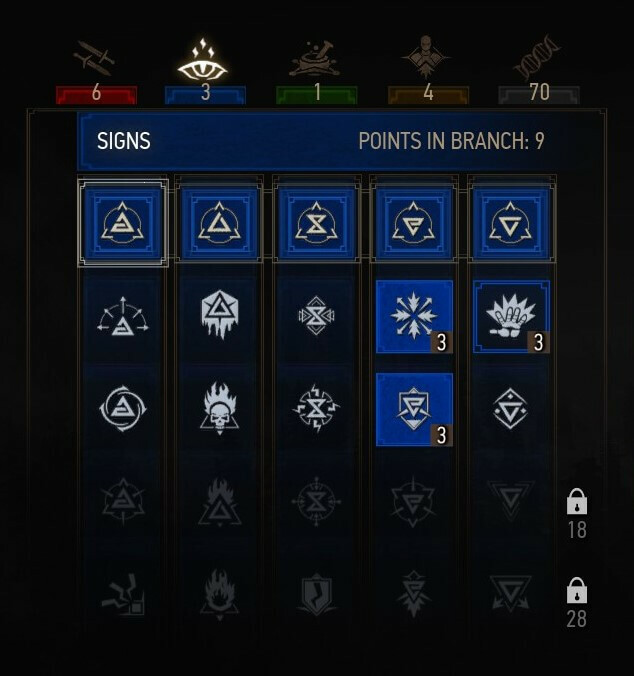 Don’t forget White Orchard has six Places of Power. Survival Instinct – Increases player hp by 500 early on, allowing the player to take a few more hits and that’s important in Death March. Cat School Techniques or the equivalent – One point grants 125% increase in critical hit damage and 25% fast attack damage. Focus – Increases damage by 15-20% when your adrenaline is full. 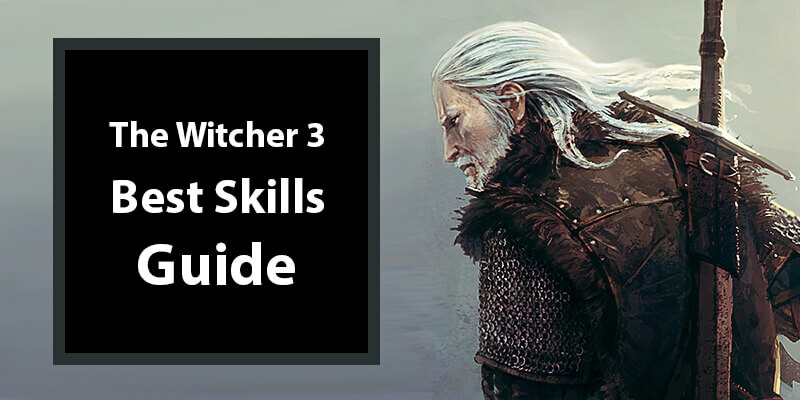 Though in the earlier levels has very little impact and you’ll find other skills more beneficial. Combines well with adrenaline increasing skills such as Resolve. Adrenaline Burst – Increases your adrenaline gain, while allowing Signs to now give you adrenaline too, diversifying your gains. Note: Sun and Stars is often recommended, but you are unlikely to actually find a slot for it. So save yourself that extra point and invest it into the combat tree. Building out the combat branch should be the main focus in the earlier levels. As this path will give you the most advantage and survivability based on your early strengths & resources. Knowing when and how to sidestep, roll, parry and hit are the fundamental elements of the combat system and you’ll need to be getting better at it as you level and grow stronger. Resolve – At max level no adrenaline is lost when hit, 100% reduction. Precision Blow/Crushing Blow – Increase the critical hit chance of attacks by 10% and critical hit damage by 75% for either strike type. Undying – Saves the players life when vitality reaches 0, by using current adrenaline points to restore a certain percentage of their vitality. Fleet Footed – Allows the player to negate 100% of the potential damage when dodging. This and Undying makes Death March far less punishing. Whirl/Rend – Whirl is an OP area of effect strike, while Rend is a single target attack that ignores enemy armour and increased critical hit chance by 50%. Razor Focus – Instantly gives you 1 point of adrenaline when you enter combat and increase the adrenaline gain of your sword strikes by 25% (when maxed). Crippling Strike/Sunder Armour – Applies a bleed (damage over time effect) that reduces enemy vitality by 125 points per second for five seconds on fast attacks. Alternatively reduce enemy damage resistance by 25% with strong attacks. Deadly Precision – At full adrenaline the player has a 6% chance of instantly killing their enemy. Crippling Shot – Disables the enemies special ability for 25 seconds when a critical hit is made, using the crossbow. Requires investment in skills like Anatomical Knowledge for maximum utility. Note: Arrow Deflection is often recommended, but I find it unnecessary when you can sidestep or use your Active Shield. But treat yourself if you get off on instant killing archers with parry skills. Flood of Anger is not recommended as it will counter Undying. 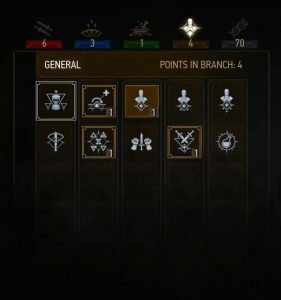 With 42 skill points invested into the tree you gain 162% increase in adrenaline point gain. Signs are a key ingredient in surviving and playing on Death March difficulty. However, the most used skills will be Quen and Axii. Leveling up Axii first will give you the dialog advantage which will save you much in the long run so level it up early on, as soon as you can afford to. Follow this by maxing the second Quen skill upgrade Active Shield and you’re all good. Delusion – Dialog advantage and reduces Axii cast time and staggers opponent if Axii fails. Exploding Shield – Quen shield pushes opponents back when it breaks. Good tactical skill to have in combat based builds. Active Shield – Surrounds the player with a force field that can absorbs damage to restore vitality. Can also be used against projectiles. Melt Armour – Permanently weakens enemy Armor based on your Sign intensity. Maximising at 75% Sign Intensity. Sustained Glyphs – Increases Yrden duration by 10 seconds and allows the casting of two simultaneous Yrdens. Note: Instead of placing three points into the first Quen skill Exploding Shield, you can put two into the Sustained Glyphs and the remaining one into Far-Reaching Yard or Melt Armour. 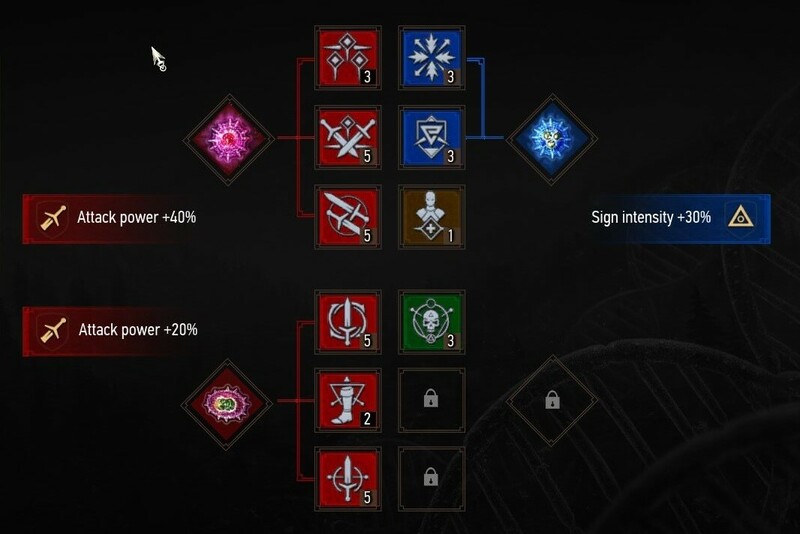 Will likely only slot two skills from this tree as you progress. Alchemy is a whole other beast and adds a lot of power in the mid to end game period. 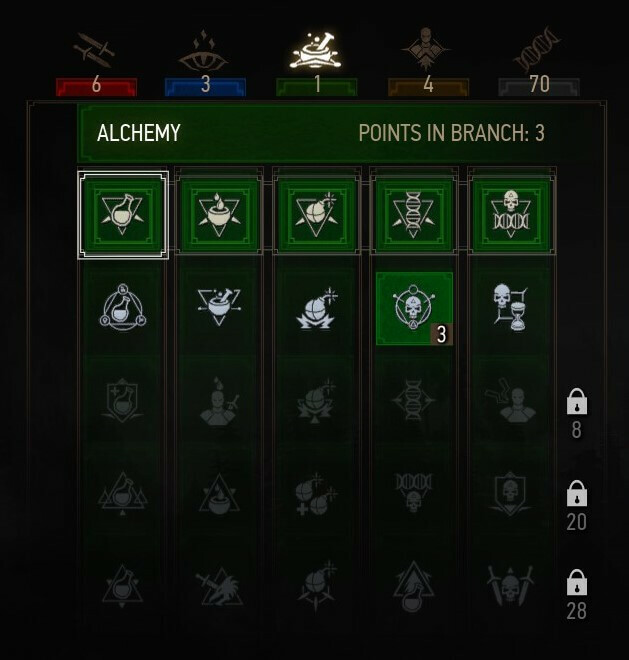 When playing Death March you will be relying a lot on oils, bombs and potions and the advantages that this skill tree affords you are unbeatable. However, there are only three to four skills that are of the highest importance and the general potion duration time bonus. strong>Poisoned Blades – Oil applied to the blades gives a 15% chance of poisoning the target on each hit. The chance is greater the higher the level of Oil used. Acquired Tolerance – Increases maximum Toxicity by 1 for every level 1, 2 and 3 alchemy formula that the player knows. Frenzy – If potion toxicity is above 0, time automatically slows when an enemy is about to perform a counter attack. Protective Coating – Adds 25% protection from the monster type the oil applied to weapons targets. Fixative – Blade oils do not wear off. Synergy – Increases the mutagen placement bonus by 50%. This is the most vital skill in the alchemy tree. Hunter Instinct – At maximum adrenaline, critical hit damage against enemies based on oil application is increased by 100%. Killing Spree – If potion toxicity is above 0, each opponent killed increases the chance for a critical hit by 50%. Note: The Potion Duration Time Bonus cap is unknown (if any). However, by just having Acquired Tolerance maxed out you receive 15%, which really helps in Swallow use & management. In theory, you should experience a 170% increase in Potion Duration Time with 34 points invest into the Alchemy tree. Delayed Recovery is not recommended here because it takes the fun out of the game, requires too much micro management and makes Geralt look disturbing. Keep in mind that the activated skills are limited by skill slots. So pick and choose them based on your requirements, playstyle and weaknesses. 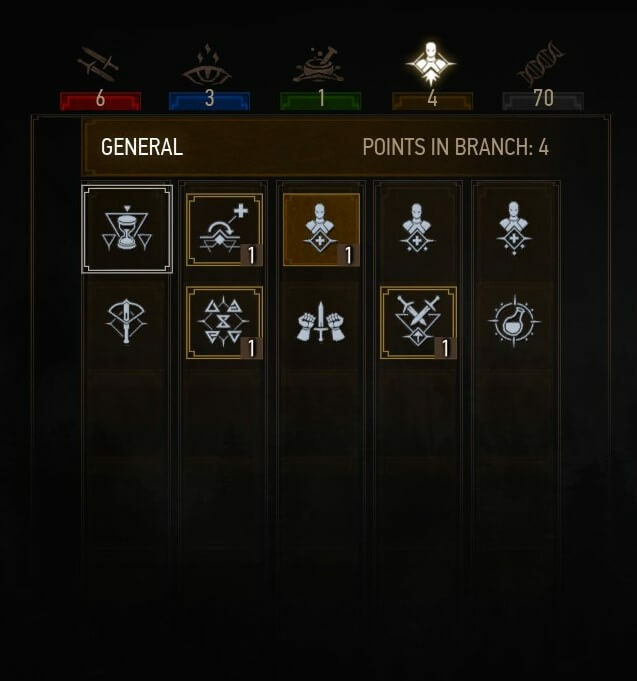 The Blood and Bone expansion will give Geralt an additional four skill slots. Skills like Survival Instinct and Focus are only good during the earlier levels and should be discarded later on. Furthermore, skills such as Sustained Glyphs, Deadly Precision and Crippling Shot are luxuries and you can do without them. Looking for the best builds? 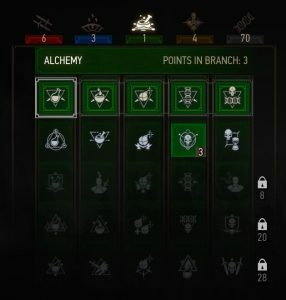 Try my Combat Alchemy Hybrid Build.